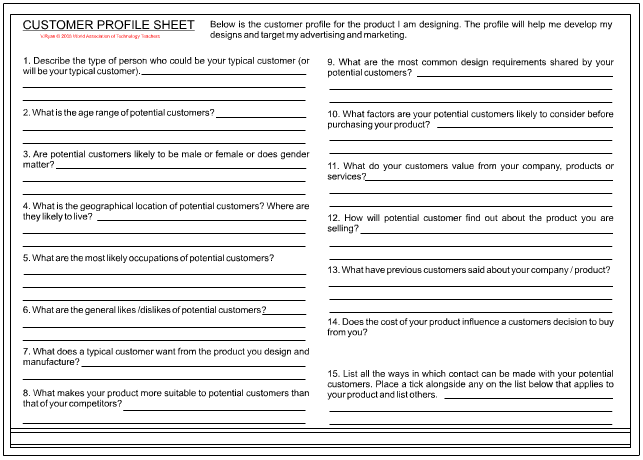 To build a customer profile you could ask a focus group some of the questions listed below and carry out questionnaires. Alternately you could ask yourself or people in your company/class the same questions. 1. Describe the type of person who could be your typical customer (or will be your typical customer). 2. What is the age range of potential customers? 3. Are potential customers likely to be male or female or does gender matter? 4. What is the geographical location of potential customers? Where are they likely to live? 5. What are the most likely occupations of potential customers? 6. What are the general likes /dislikes of potential customers? 7. What does a typical customer want from the product you design and manufacture? 8. What makes your product more suitable to potential customers than that of your competitors? 9. What are the most common design requirements shared by your potential customers? 10. What factors are your potential customers likely to consider before purchasing your product? 11. What do your customers value from your company, products or services? 12. 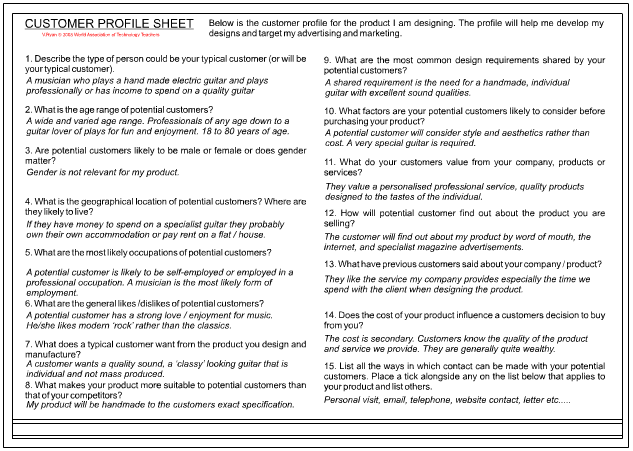 How will potential customer find out about the product you are selling? 13. What have previous customers said about your company / product? 14. Does the cost of your product influence a customers decision to buy from you? Marketing Literature - through the post. When you have created a customer profile you will be able to focus all your efforts on potential customers. This will help you promote / advertise your product directly to those most likely to buy.